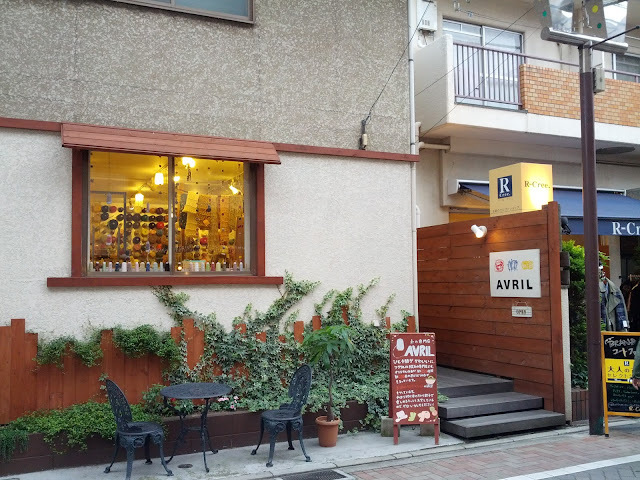 As promised, let me introduce you to my favorite yarn shop in the Tokyo metropolitan area, Avril. Avril is located in Kichijoji, at the end of the Keio Inokashira line which you catch from Shibuya. I am lucky enough to live close to the shop; it takes me 20 minutes from door to door! So this little yarn haven has a very interesting business model: they sell yarn by weight, with 10g as the minimum purchase. All of the walls in Avril are covered with huge spools of yarn. The labels tell you how many meters are equivalent to 10g of each type of yarn. Once you've selected your fiber, a shop assistant will reel your yarn on a spool. If you find a great fiber but not in your desired color, you can always buy natural yarn and dye it at home. 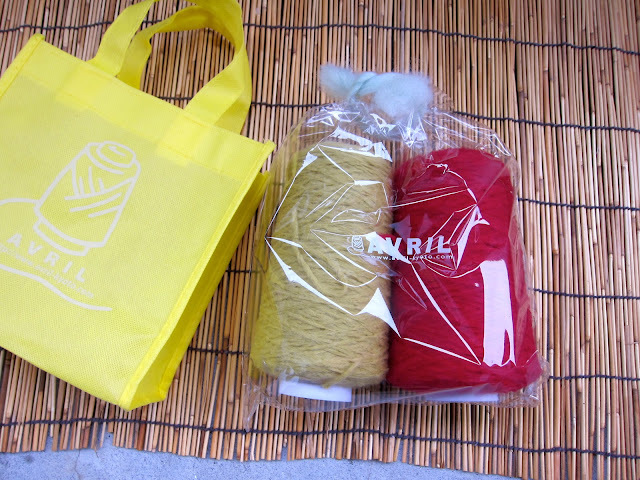 More interestingly, the shop's staff can help you create your own yarn by combining different fibers together. 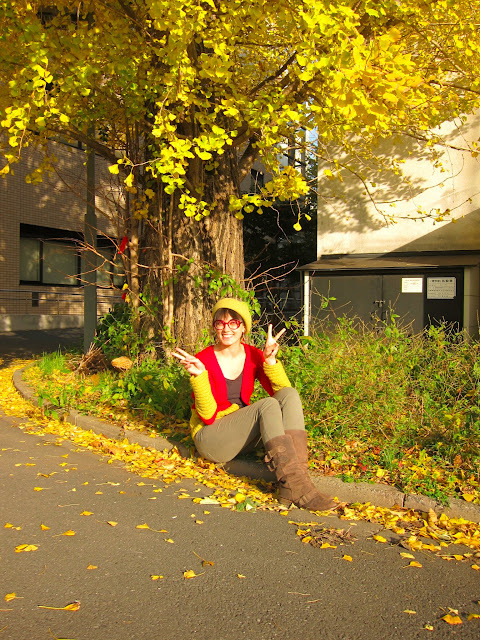 For my Autumn cardigan, I chose this super-soft LilyYarn mix of wool and nylon: 150g of melon color and 190g of red. I've probably got only 10 meters of each color leftover. A nice lady in Avril helped me calculate the necessary amount of yarn; the people there are super-duper friendly! When I returned to Avril last week to buy more yarn for my future jumper, they recognized me and we talked as if we had known each other for ages. If you are interested in buying some yarn from Avril, they do support English-speaking customers and ship internationally. Have a look at their online catalogue and order by email. 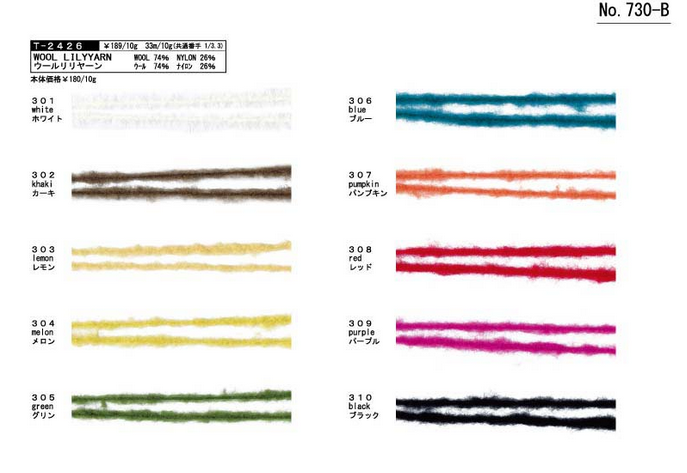 Avril sells yarn sample catalogues for each type of fiber as well for only 150 yen (approx. $1.80). I am praising this shop so much because, in knitting as in sewing, a great result depends on the quality of the material. Are you also into knitting? Hello everyone! I am alive and kicking again, full of energy for more sewing and knitting! Yes, I picked up my knitting needles again and nothing can stop me now. In fact, knitting was the first craft I mastered. When I was four or five, my mum showed me how to do basic stitches and subsequently tiny scarfs and blankets filled my dolls' wardrobes. Before I embarked on my last trip, it was out of the question to take some sewing with me; nobody would let me sew in a hospital :) So knitting seemed a natural alternative and also fitting for the season. I ran to a yarn shop - an amazing place which I am going to dedicate an entire post to - to get some beautiful wool for a very simple cardigan. And look how nicely it matches the autumnal landscape! The other day I visited a friend who is expecting a baby to transform her regular jeans into maternity ones. 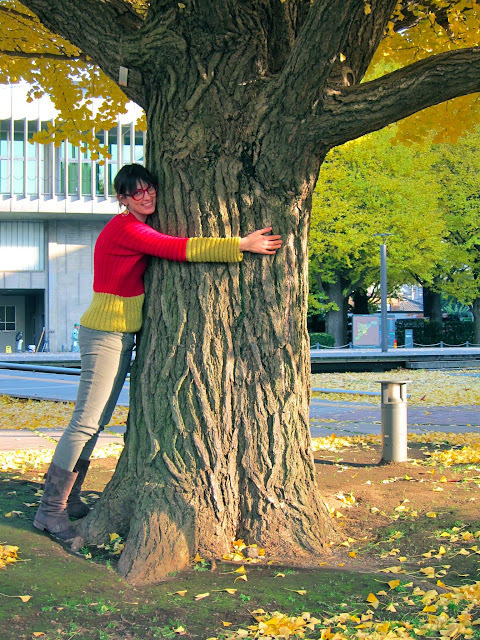 She lives near Tokyo University, famous for its gorgeous park; the park is packed every spring for hanami and in autumn for momijigari. Now you can understand why! Don't you think my new cardigan could be a perfect camouflage if I played "hide & seek"? The combination of the warm weather, the smell of autumn leaves and the chai tea which we drank beforehand made me absolutely mad and uncontrollable! The cardigan, classified as 'easy', is based on Phildar pattern from Catalogue n63. To knit a similar cardigan, you need to know two basic stitches: knit and purl stitches. My knitting style is Continental, as opposed to what is known as English style. 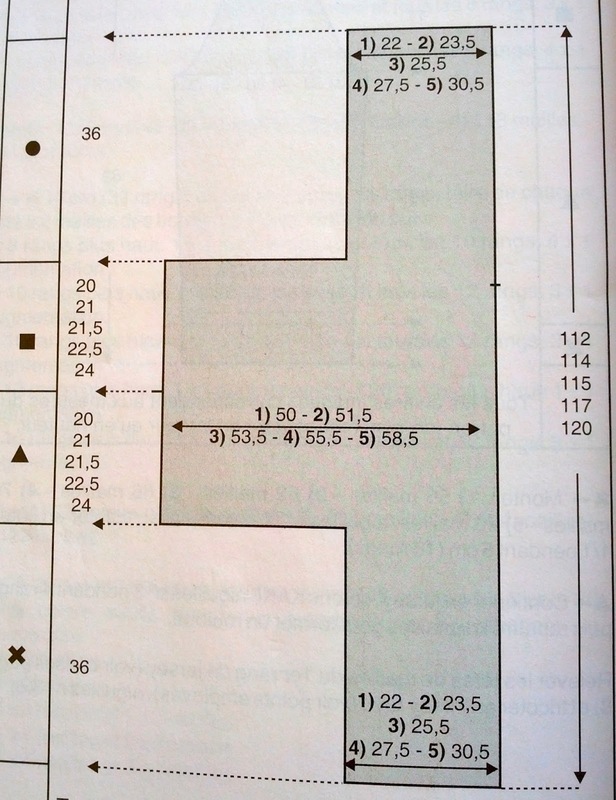 Construction-wise, you cannot find anything easier! The cardigan is made up of two parts, with integrated sleeves represented in the middle of the scheme. Once you've finished both parts, sew them together stopping at the notch. 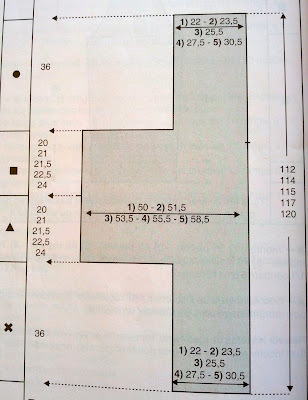 Don't forget to make buttonholes! I'd especially like to draw your attention to the buttons! 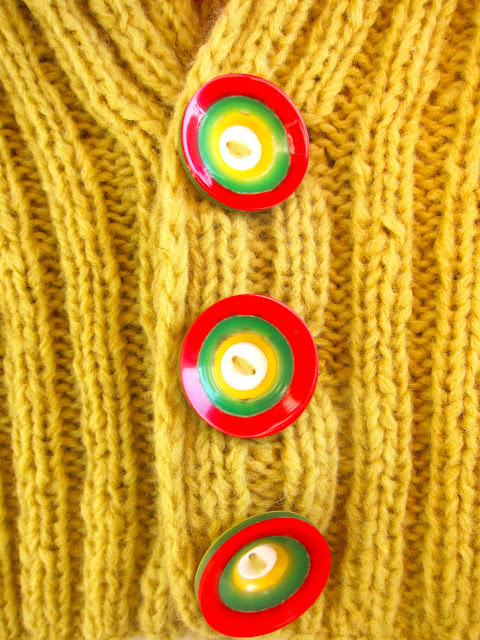 I found them in a vintage shop and each button was the price of a meter of fine silk. With my eyes closed, I gave my credit card to the shop assistant and immediately threw away the receipt. But to me, it was worth it. I think they match the colors of the cardigan perfectly! In the end, if we want to justify ourselves we can always find a way, can't we? As great as sewing is for self-reflection, knitting is good for watching movies - this cardigan equals seven movies and one audio book! Whilst I am working on more knitting, I am also continuing with sewing projects. A couture skirt which I've been working on over a week is only waiting to be lined. I can't wait to show it on here and share a couple of new techniques! 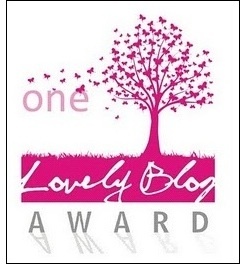 I woke up this morning to discover that Maider from Masustak-eguzkitan nominated me for the One Lovely Blog award! Contact each of these bloggerss letting them know they've been nominated. I am originally from Ukraine. I left my country 12 years ago and since then I have lived in five other countries (France, Spain, Ireland, Singapore and Japan). And I hope to live in at least five more! I don't like cooking. I often treat my guests to pizza and snacks from the supermarket. My favorite food is Thai and Korean. I love storytelling in its various forms - books, movies, ballet, opera, theatre - but I am a terrible storyteller myself. I don't own a TV and am very happy about it. 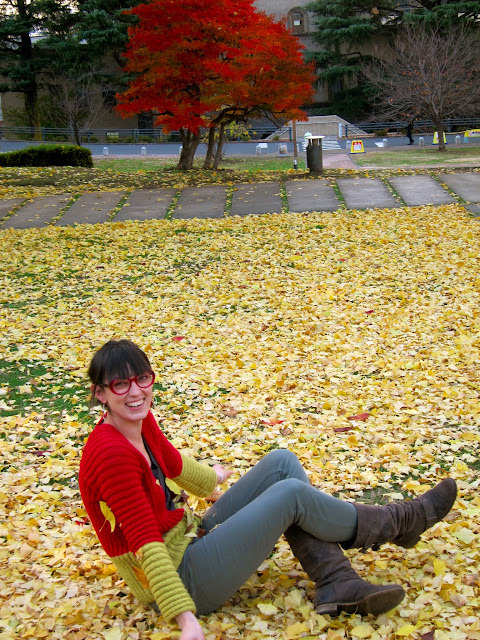 I once spent 5 days living in a Buddhist temple with monks in South Korea.